Haiti was not on my top 10 places to visit prior to the earthquake. Two years ago, I learned I would travel there to engage the public around the lives of those affected by access to clean water through a photo-narrative project. I just returned from Haiti, a country where much of the world’s focus has been allocated; however, there are still many souls who have been seemingly forgotten. I spent most of my time outside Port-au-Prince in pockets of northern and central Haiti. Olivier Mills, my technical advisor from The Centre for Affordable Water and Sanitation Technology (CAWST) orchestrated the trip. 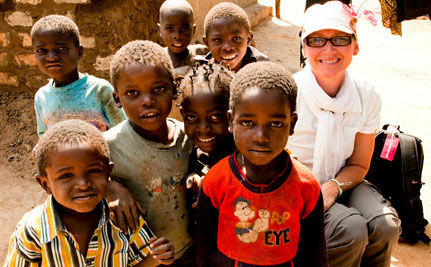 During the summer of 2009, I traveled to Zambia and India to kick off the photo-narrative project Waves for Change. With that experience behind me, I felt somewhat prepared when arriving in Port-au-Prince a few weeks ago. I was not a field virgin! Luckily so, given the way we were culturally slapped in the face on our initial sojourn. I think we would have been on our knees if we came to Haiti without being christened through our “in field” work last summer. Life is harder in Haiti, challenges are everywhere and our indoctrination was gradual with Africa and India first. The stinging cultural backlash I felt during my maiden voyage in Zambia had me questioning seemingly fruitless efforts in development all because it wasn’t happening in what I deemed to be a logical time frame. The needs were great, the challenges even bigger, the victories small and often one-step forward, two steps back, or so it seemed. What was really being accomplished? What difference did me being there make? I felt heartbroken, even humiliated. By the end of our time in India however, a different feeling took root. A complex understanding grew little by little — success takes seeds, grows roots and slowly transforms. I saw how one person can indeed make a difference and became convinced I needed to do the same. Port-au-Prince is a very chaotic, busy hive. Touring the streets in the city centre, one could imagine the earthquake had just happened. The buildings are collapsed and in repose as they were the day after the quake nine months ago. Tents are pitched like white and blue weeds overtaking the ruins. Have no doubts the Haitian people themselves, and only themselves, will do the rebuilding. They cannot wait for the bureaucratic channels to open their gates. We arrived by plane to Cap-Haitian, a northern seaside town. I was frequenting worlds of a different nature. Places like Blue Hills where there is only one working water pump out of three. There, I witnessed a fight break out for water — water that is not drinkable without treatment, water that will cause great illness. The scenes I witnessed there are hard to take. I saw people living in and amongst rot. It takes a while to process that, to understand, to comprehend and finally to accept that is the way it is. These are the places where I saw movement, sparks of brilliance in people like Madame Bois, Shada’s answer to immovable problems. She is an unstoppable force. And Marte Mervieux, a one-woman empowering machine working with women’s groups in Cap-Haitien and Petite-Rivieres de l’Artibonite, a market community set amongst rural farms in the Artibonite Valley. I was ready in a way that I was open to the process. I had my Medex card, evacuation card, a wad of cash for emergency and a steri-pen to treat the water. We had pre-trip discussions about what to do if taken hostage, which family members to call (I have five children) and extra food as it would not always be plentiful. What I wasn’t prepared for was how Haiti would hijack my dedication. I came away with a clear-cut idea to return and work in a focused way to help with the transformation of Haiti. As a photographer, I initially was not sure how to approach things in Haiti. People didn’t seem as happy to see me as they did in Africa or India. In fact they seemed a little hostile. They would shout at me. As I settled into the routine, I became accustomed to the bark of life there. The bigger the challenge, the sweeter the victory and perhaps it’s part of the allure of working there. After spending time in Haiti working with youth on an education project using cameras, I saw ways to open up dialogue, instill pride and teach about water, hygiene and HIV. It really boils down to responsibility and empowerment. My next step is to take this program further, much further. I met countless souls like this during my time in Haiti, and I will share their stories. Please follow my story. Cate Cameron is a humanitarian photographer who uses the strong visual imagery captured through her lens to illustrate the intrinsic connection between access to clean drinking water and poverty. Just back from Haiti, Cate has traveled to Africa and India to pursue her work and will document clean water projects in Kenya later this year with P&G’s Children’s Safe Drinking Water program. thanx Nicole for posting, God bless all. wich can be used for World Change"